Fronted by the heartfelt voice of Jesse Ray Smith, this debut album showcases the group's infectious, hook-based, Americana style songs. 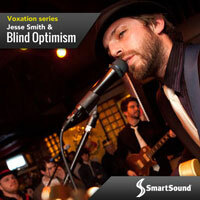 Jesse Ray and Blind Optimism deliver an evocative and memorable performance that will support any contemporary video with drama, passion and believability. As with any Voxation album, use Sonicfire Pro?s Mood Mapping technology to bring the lyrics and vocals in or out at just the right moment to punctuate the storyline with maximum impact.